Microsoft had a few surprising announcements at the Build developer conference today in Seattle. One was that it was expanding its support for Linux-based operating systems. The OS giant already stunned the community last year when it added a Bash shell and support for Ubuntu at last year’s conference. This year they are adding support for SUSE and Fedora as well. Redmond is even adding the three distros to the Windows Store. Engadget says that once you put Windows into “Developer Mode” and turn on Linux support, you simply go to the Windows Store and download your choice of the three Linux distributions. From there you just run the OS on top of Windows with no need to create a separate partition or run a virtual machine. TechCrunch reports that Linux systems will be able to run concurrently. "You can even run all three Linux systems side-by-side." It seems that Gates and company are trying to make friends with the developer community which largely uses open-source tools and operates in Linux environments. Just last summer Microsoft released .NET Core 1.0, its software development platform, which now runs on any operating system including macOS. 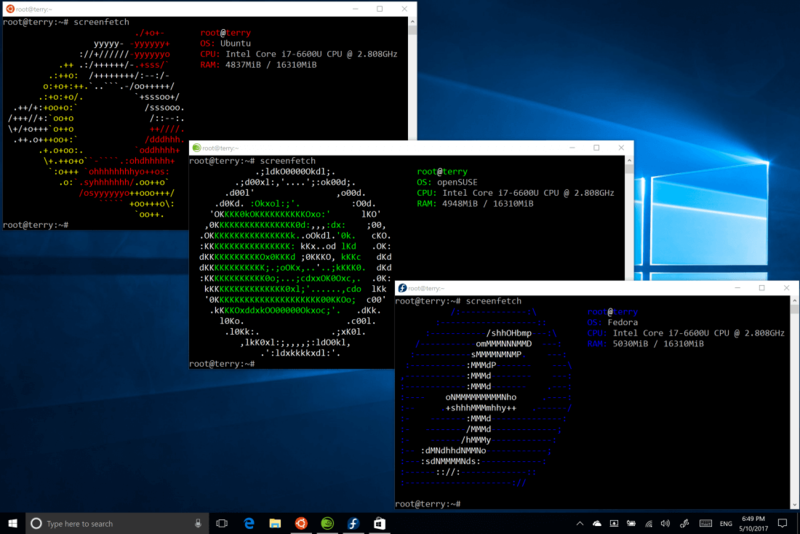 Microsoft’s Windows Developer Platform Vice President Kevin Gallo indicated that “the company didn’t really receive a lot of requests for supporting any of Bash’s competing shells, but it did receive plenty of requests to support other distributions,” so they obliged. No word yet on exactly when the Linux offerings will hit the Windows Store. Presumably, it will be soon or at least by the time Windows 10's Fall Creators Update is released. Awesome news, have any one been able to fiddle a bit with this? There are a lot of network related tools that run awfully in windows that makes a lot of people wish to dual boot or at least have a live usb drive. I can think of at least one friend that will be more than happy about it. That's the problem with emulation - - performance usually stinks. But the object is to create compatible web tools and services, not run 24/7 in that mode. Just last summer Microsoft released .NET Core 1.0, its software development platform, which now runs on any operating system including macOS. The problem is, .NET CORE 1.0 creates another dependency for all Hosting Providers. While we all expect MySQL & PHP to be supported, just how soon (if ever) will godaddy, et all add this to any virtual Host support??? Can you upgrade from Winblow$10 to SuSE? In the old days you could just run the command DELPART to do so.